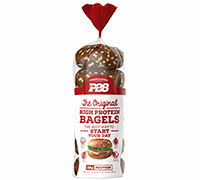 We are pleased to present to you our brand new P28 High Protein Bagels. They are 100% Natural, 100% Whole Wheat, and jam packed with 28 grams of protein. Each bagel is carefully formulated to provide you with the highest quality ingredients possible. Each bagel is made with the highest quality source of whey isolate protein, Oats, Flaxseed, Sunflower Seed and Millet. Our P28 Bagels also contain important Omega 3's, and is a rich source of 8 essential Amino Acids. This product also is cholesterol free and a good source of fiber. 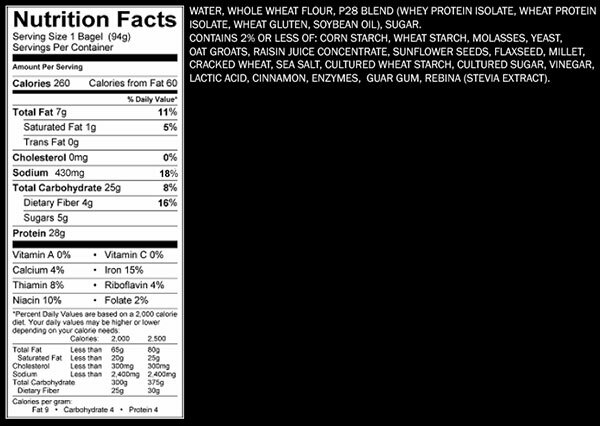 P28 High Protein bagels makes a great pre-post workout snack when nutrition is the most important. Don't have time to prepare a meal and need to get to the gym? Just add two tablespoons peanut butter and you have a healthy snack jam packed with protein.